With next Monday a public holiday across most states including New South Wales and Victoria, auction activity is much more subdued this week, with 1,132 auctions currently being tracked by CoreLogic, slightly higher than this time last year when 1,100 auctions were held. Although Melbourne is usually the busiest auction market, this week just 329 auctions are scheduled, down from 1,188 last week and similar to last year (341). Sydney is the busiest city for auctions this week with 571 homes going under the hammer this week, down from 1,019 last week, and busier than the same week last year when 463 auctions were held. Across the remaining capital cities, Perth is the only city to see an increase in auction volumes, while in Tasmania, the number of auctions is likely to remain unchanged week-on-week. 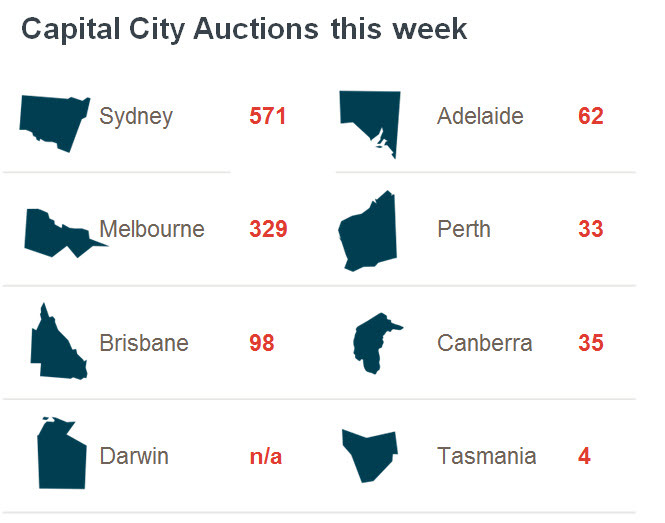 All other cities will see auction volumes fall when compared to last week. This week, Mosman in Sydney is the busiest individual suburb for auctions, with CoreLogic tracking 14 auctions so far this week. Following Mosman is the Melbourne suburb of Craigieburn with 10 auctions set to go under the hammer. Dee Why in Sydney and Noble Park and St Albans, both in Melbourne, each have 9 auctions scheduled over the week. The final auction clearance rate has fallen for the second week in a row, slipping to 69.8 per cent last week, down from 71.3 per cent the previous week. Although the clearance rate has fallen, it remains slightly higher than the same week last year when 68.2 per cent of auctions were successful. There were 2,578 homes taken to auction last week, down from 2,885 over the previous week, however this time last year, fewer auctions were held across the combined capital cities (2,008). Across the two largest auction markets, Sydney and Melbourne, clearance rates continued to fall with both Melbourne and Sydney recording their lowest clearance rates for the year. Melbourne’s clearance rate fell to 73.1 per cent last week, down from 74.2 per cent the previous week, while Sydney recorded a final clearance rate of 71.9 per cent last week, down from 72.7 per cent. Over the same week last year, Melbourne’s clearance rate was slightly weaker at 71.1 per cent, while Sydney’s clearance rate was 72.9 per cent. Looking at the smaller auction markets, Adelaide (59.3 per cent) and Tasmania (66.7 per cent) recorded a week-on-week rise in auction clearance rates, while in Brisbane, Canberra and Perth, clearance rates fell when compared to the previous week. Across the five regional markets that CoreLogic monitors, results were varied. Hunter, Wollongong and Geelong all recorded clearance rates of at least 70.0 per cent, while across the Sunshine Coast, just over half of the reported auctions were successful (52.6 per cent). Gold Coast had the lowest clearance rate with just 33.3 per cent of the 48 reported auctions recording a successful result.